TRUMBULL, CT, January 03, 2019 /24-7PressRelease/ -- In a supporting move to assist in the execution of their annual growth plan, Extra Duty Solutions has hired industry veteran Ricky Braen formerly of Visual Computers Solutions/Jobs4Blue as their Senior Business Development Executive. He brings with him 25 years of experience in the law enforcement industry as both a Police Officer and trusted vendor representative. Ricky comes to Extra Duty Solutions via Freehold, NJ Software Company -VCS where he built a reputation amongst law enforcement leaders as a dependable and trustworthy solutions provider and is often deemed as "one of the good guys" by his peers. Before that, Ricky enjoyed a decorated 25-year career as a Police Officer for Brick Township PD in New Jersey where he served as an Administrative Sergeant and Extra Duty Employment Coordinator. He will play an instrumental role in expanding EDS' footprint across the country as it is rapidly becoming a national brand as well as industry leader's top choice for managing extra duty programs. Along with Ricky comes Marketing Director, Dominick Mauro also formerly of VCS who will join him in EDS' latest expansion efforts as the company is set to open their 3rd Operations Center overall and first in Wall Township, NJ. "Knowing that my achievements have been noticed by an elite organization with a great reputation is extremely humbling. I'm blessed with the opportunity to represent the top leader in managed solutions for extra duty for years to come." "Ricky's established reputation combined with his 25 years of industry experience makes him an integral part of our overall growth strategy as we're prepared to increase our exposure nationally over the next 12 months." Prior to the hiring of Ricky Braen and Dominick Mauro, Extra Duty Solutions recently announced the addition of their new Director of Operations and 27-year veteran of the U.S. Coast Guard, Keith McTigue. Keith comes to EDS as an accomplished Officer, Senior Executive, and Leader with extensive experience in Operations and Law Enforcement. Prior to joining EDS, he successfully fulfilled his tenure as the Principal Advisor and Senior Program Director for the U.S. Coast Guard in Honolulu, Hawaii. EDS is the largest and fastest growing company which provides extra duty solutions managed serviced solutions to law enforcement agencies. 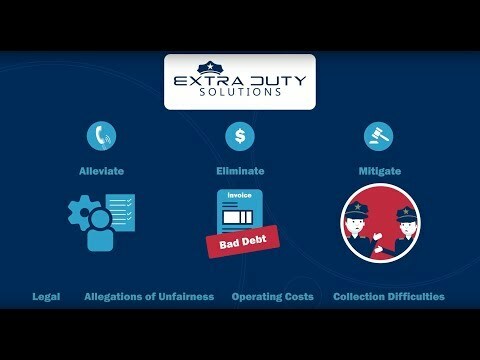 By handling everything from customer interactions, the scheduling of extra duty jobs, officer payments and customer invoicing and collections, EDS eliminates all the financial risk and limit the legal risk for both police departments and municipalities. EDS' recent success has led the company to an average growth rate of 25% per quarter and are currently servicing police departments across 11 states with 2 more coming on board in the next 2 months. For all media inquiries or to learn more about EDS' services, please contact us at info@extradutysolutions.com. View our 3-minute introductory video to get an overview of our service.